Wines from New Zealand have been popular in the U.S. for several decades now. They are best known for sauvignon blanc from Marlborough, with its grapefruit and grassy characteristics. But, other grapes grow in New Zealand that make fantastic wines like pinot noir from Central Otago, Chardonnay is also grown in many regions as well. Today’s featured wine is pinot gris from Kim Crawford winery. The grapes for this wine were grown in two sub regions of Marlborough, Awatere and Wairau. Winemaker Anthony Walkenhorst has made a wine that shows delicate apple and pear notes, with some lemon zest and slight herbaceous aromas. It’s balanced with medium to high acid making it a nice wine to pair with fresh seafood or spicy Asian cuisine. 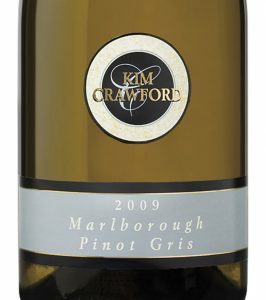 Kim Crawford winery was launched in 1996, so for 20 years they have been making great wines, collecting notable scores and they continue to maintain consistent, high quality wines. This will be a perfect and refreshing match for your Tuesday evening fare. Cheers!